The Friends of Little Tokyo Branch Library will host a celebration of the 10th anniversary of the permanent establishment of the Little Tokyo Branch Library in Los Angeles at 2 p.m. on Saturday, Sept. 12. 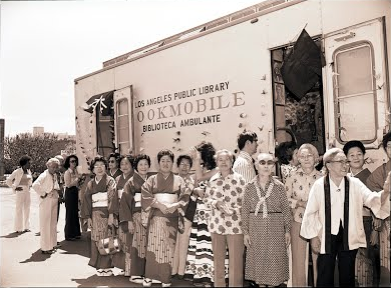 The Little Tokyo Branch Library started out as a Los Angeles Public Library Urban Bookmobile. The celebration will include a narrated slideshow of milestone moments of the branch’s 38-year history as well as songs in English and Japanese presented by Grateful Crane Ensemble members Keiko Kawashima and Scott Nagatani. The program is free and open to the public. Light refreshments and tea will be served. Prior to 2005, the Little Tokyo Branch Library had evolved from one of the stops of the traveling Urban Bookmobile of the Los Angeles Public Library (LAPL) system to a temporary, experimental branch in rented and borrowed spaces in Little Tokyo. The facilities of the temporary, experimental branch were supported entirely by community donations organized by the Friends. On Sept. 8, 2005, civic and community leaders joined to celebrate the permanent establishment of the Little Tokyo Branch Library at 203 S. Los Angeles St. (at Second Street), built with funding from Proposition DD, the 1998 Branch Construction Bond, enacted by the voters of the City of Los Angeles. For more information, visit http://www.friendsoflittletokyobranchlibrary.org/.